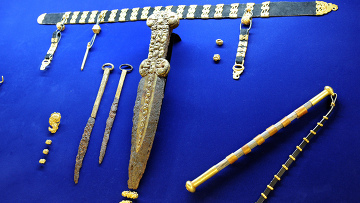 The first obstacle to the return of the collection of artifacts from kurgan “Arzhaan-2”, discovered in 2001 by the Russian-German expedition under the leadership of Konstantin Chugunov, was the lack of a suitable building for keeping such valuable materials. The government mobilized all effort to finish the construction, which dragged on for more than 17 years, and the new museum building finally opened on February 7 of this year. on the invitation of The Chairman of the government of Tuva, were senator Sergei Pugachev, Princess Salimah, who is actively involved in charity activities, the acting director of the famous British firm Asprey, which specializes in the sale of luxury items, Lord Bruce Dundas, and the scientific worker of the Hermitage, Konstantin Chugunov. The new exhibition, “The Treasures of the Valley of the Kings. 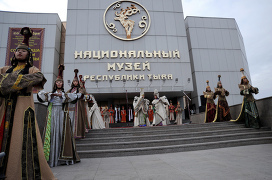 The Royal Kurgan Arzhaan-2”, was produced by the workers of the National Museum. The clothing of the buried King’s guard was covered in six thousand miniature gold plaques, sewn on in an intricate pattern, there were head dresses, hair ornaments, pendants of gold, turquoise, amber, a massive gold torc of the leader, on which the hand of the Scythian craftsman depicted intertwined patterns of likenesses of horses, reindeer, panthers – all of these are true masterpieces of the craft of jewelry making. Even with contemporary level of technology, it could be imitated by only some individuals, explain the museum workers. The opening of the long-awaited exhibition gave the stimulus for a whole sequence of various festive events, dedicated to the Day of National Unity. The organizers see this as deeply symbolic. This holiday is a symbol of the unity of people of various faiths, ethnicities and conditions for reaching great goals, but it is also symbolic of connections throughout epochs and generations. It is about knowledge of one’s history and ability to be proud of it. Schoolchildren who finished the first quarter of the school year with excellent results were invited to the exhibition. On this holiday, the museum was visited by approximately 1000 schoolchildren. “Today’s event is not significant mainly because the Scythian gold returned to Tuva. Its main significance lies in the fact that based on this heritage, we can bring up the young growing generation. – noted Sholban Kara-ool. 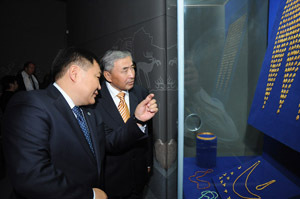 The exhibition “Treasures of the Valley of Czars” will be a permanent exhibit of the National Museum of Tuva. The welcome of the guests at the entrance to the National Museum of Tuva. Viscount David Linley, his wife Serena, Lord Bruce Dundas and his wife Ruth Kennedy are becoming acquainted with the exposition of “Treasures of the Valley of Czars”. Golden cup from kurgan Arzhaan-2. Premier of Tuva, Sholban Kara-ool and ex-premier Sherig-ool Oorzhak. 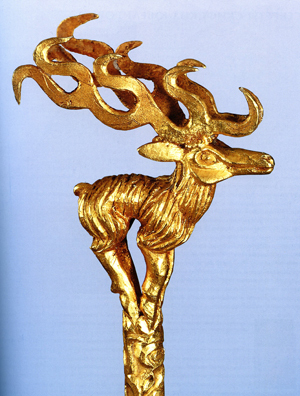 Golden deer, top of a hairpin. Some little-known facts about the archeological discoveries in the Valley of the Kings. …When the gold was taken from the site of the excavations to Kyzyl, because of the lack of funds, it was practically impossible to put the priceless package into a bank in the capital. Again, local private contacts had to be utilized. Before being sent off to St. Petersburg, the treasure from Arzhaan-2 kurgan was kept in the apartment of the journalist Dina Oyun, who placed her apartment at the disposal of the archeologists…. (From Russian SMI on Arzhaan-2). Nobody remembers exactly anymore how the Valley of the Kings got its name. The local population, who was firmly convinced that only royalty was buried in these kurgans, believe that the name was born in time immemorial. As soon as the snow disappears in the steppe around the Arzhaan settlement, archeologists will go back to continue excavations. As Konstantin Chugunov believes, it cannot be ruled out that also the neighboring kurgans hold riches, which were not touched by tomb robbers. Chugunov has been studying Scythian burials for almost 20 years. Having studied uncountable historical and kartographic materials, he came to the conclusion that the Valley of the Czars in Tuva has tremendous potential from archeological point of view. Many kurgans are located here, surrounded by mysterious ritual stone encirclements. It was believed that most of the kurgans had been robbed even in the ancient times, but Chugunov and his colleaques from the German Archeological Institute (DAI), Professor Herman Parzinger and Dr. Anatoli Nagler decided to take a risk. So, in May of 2001, a joint Russian-German archeological expedition went to Tuva. 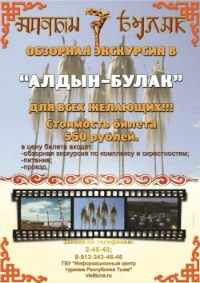 It was organized by the Central Asian archeological expedition, based in the St.Petersburg branch of the NII of Russia, of the cultural and natural history department of RAN. The Eurasian Department of German Archeological Institute was the international partner. In the deep quadrangular pit, there was a well-preserved log structure with double walls made of logs of Siberian larch. On the carefully worked floor, there was a double burial – a man and a woman, attired in clothing decorated with small sewn-on gold plaques. Their head dresses were decorated with gold plaques in the shape of horses, deer, panthers. The woman’s head dress was crowned with hairpins with engraving in so-called Scythian animal style. One of these was topped by a sculpture of a standing deer. In the area of the neck and chest, there were earrings, multiple pendants and beads from gold, turquoise, and amber. Around the man’s neck, there was a massive gold torc – a symbol of the ruler. 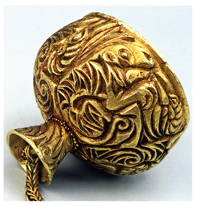 The entire surface of the torc, as well as of the other objects, was decorated with images of animals , and appeared to be, in its way, a virtual encyclopedia of the art of the nomads of Central Asia. The pants of the buried King were over-sewn by fine gold beads, the boots were covered with gold leaf. In front of the faces of the buried persons, there were bronze mirrors. Next to the woman, there was a gold pectoral, leather containers with grains, there was a wooden scoop, and bronze and stone incense burners. Next to the man, there was a decorated belt, with a bow, quiver and a war axe fastened to it. A special place in the main burial complex was reserved for iron weapons, which were encrusted with gold. Careful restoration work by the workers of the Hermitage permitted us to view these masterpieces of ancient master craftsmen. The felts, fabrics, leather items and clothing were not preserved, but the gold plaques and beading which decorated them, allowed the reconstruction of the furnishings of the funeral chamber and the buried persons. Soon after the excavations of “Arzhaan-2”, the leader of the expedition, Konstantin Chugunov, received the nickname “Russian Schliemann”. It is not very fair – in contrast to Schliemann, Chugunov is a professional archeologist – but it accurately reflects the resonance of his discoveries. The burial-memorial complex, with the central structure of 80 meter diameter, proved to be an intact, untouched by robbers, burial of the Czar’s guard, their family members, and horses. The multiplicity of gold jewelry, decorations of weapons, unbelievable, to this day, in these areas delicacy of workmanship of the materials, the wonderful state of preservation of the constructions, and the intactness of the contents of the tombs, became a source of astonishment of laymen as well as the specialists, a source of scientific as well as political disagreements, and source of interest of “black market” archeologists. We can disabuse those: such discoveries happen only once in several centuries, there is no reason to hope for more. Arzhaan-2 brought a colossal amount of scientific information, the work-up of which is far from finished, and generated masses of new questions. Where did the Central Asian nomads get these riches (just in the main burial, the aggregate weight of gold was more than 20 kg, not counting the fine beading)? Where and from whom did Scythian craftsmen learn the technique of gold working? When did they learn the artistic finesse of the “animal style”? What instruments did they use to work the gold and bronze – until now, it was thought that they did not know how to make steel?